← Will Marty Walsh become another Michael Bilandic? The question during the 2014 gubernatorial campaign was often “Will the real Charlie Baker please stand up?” Today, Governor Baker stood before a meeting of the New England Council, the real Charlie Baker, the one I knew from his days in the highest echelons of the Weld and Cellucci administrations. He is smart, comfortable in his own skin, droll, practical and seemingly quite down to earth. Call this a honeymoon period. Acknowledge that he has a longstanding relationship with the Council. Even so, for those who were long infatuated with predecessor Deval Patrick’s grace and vision, Baker shows himself well able to fill Patrick’s shoes and more. That “more” entails skills at a ground game, a zest for finding out the details and implementing practical, workable solutions. Things like tackling gridlock by asking that streets get plowed all the way to the curb so buses have a place for passengers to get on and off. Like using the National Guard to shovel out the 20 miles of Red Line tracks between JFK and Braintree, ensuring that it will be up and running in five or six days, not the 30 days originally announced. Working collaboratively with the all-Democratic Congressional delegation to get more federal disaster relief. Working successfully with the predominantly Democratic legislature to amend the fy15 budget to accommodate a larger-than-expected state deficit. 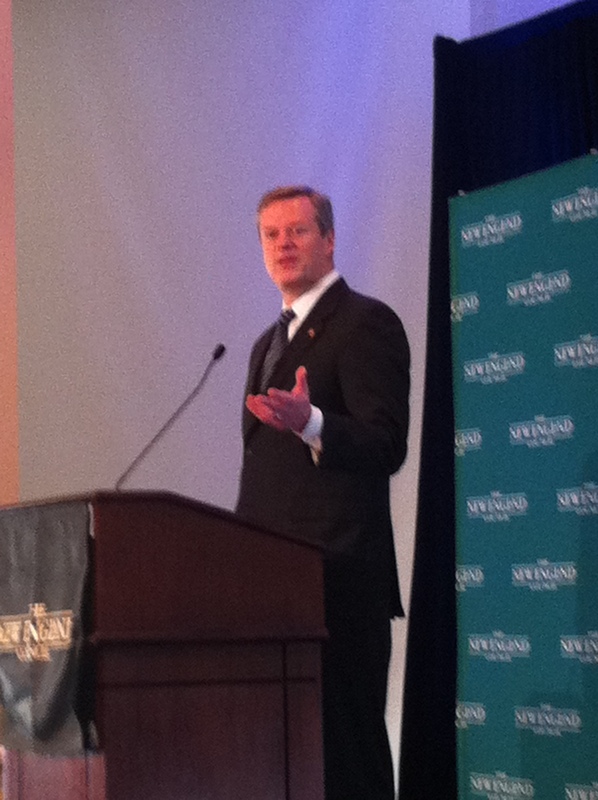 Given the political make-up of Massachusetts, Baker has to be post partisan. So far he seems to be, as suggested by his cabinet comprising Republicans, Democrats and Independents in equal amounts. He claims that, in most cases, he didn’t even know the party designations of his appointees. Maybe. Maybe not. But he is persuasive in asserting himself to be a “Let’s get stuff done” person. He is committed to bringing growth in health care costs in line with growth in other parts of the state budget (so they don’t devour other programs) and to bring spending in line with revenues. He’s also committed to help keep Massachusetts businesses competitive in an era of strong dollar pressures by looking for ways to cut energy costs. Toward that end, he’d push to expand pipeline capacity along existing rights of way. Of particular note was his answer to my question about his position on a possible statewide referendum on the Olympics and a proposed legislative push for greater Olympics transparency. He believes in our “robust” referendum process and, over the years, has participated in some past referenda. “There’s a process in place,” he said, and, if opponents want to pursue it, ” by all means,have at it. It’s what it’s there for, and that’s a good thing,” he said. On the issue of transparency, his “hope is that the process will be more and more transparent going forward,” through interim refinements of the proposal due September of this year and again in 2016, with the final bid in the fall of 2017. The process is starting now. He is pleased that Boston 2024 will next week start a series of public meetings around the state. He seems confident that, as soon as this coming September, the public will be getting a lot of information on what the event will look like (in terms of venues,) the nature of the public commitments being requested, especially for infrastructure, and the extent of private funding, which will be significant. I hope he’s right, but I think his optimism about the process will only be validated under sustained pressure from citizen engagement, and efforts by No Boston Olympics and United Independent Party Chair Evan Falchuk to push the referendum strategy. Still, it’s reassuring that Baker seems not to have drunk the Koolaid as Mayor Marty Walsh often seems to have done. There’s much that’s reassuring about Charlie Baker just 43 days into his administration. Of course, much remains to be done in the next 1288 days of his term. Here’s hoping. This entry was posted in Politics and tagged Baker's cabinet picks, Boston 2024 referendum, Evan Falchuk, expand pipeline capacity, Governor Charlie Baker, Mayor Marty Walsh, National Guard Red Line work, New England Council, No Boston Olympics, referendum on Boston Olympics, state budget deficit. Bookmark the permalink.